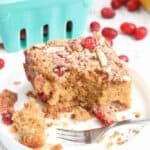 Tender cake is packed with tart cranberries and a hint of orange zest, and loaded with slivered almonds and a sweet crumb topping. Preheat oven to 350° and line an 8×8 pan with parchment paper. Set aside. In a medium bowl, combine almond flour, coconut sugar and coconut oil. Use a pastry cutter to cut in the coconut oil until completely combined and crumbly. Set aside. In another medium bowl, whisk together almond flour, coconut flour, baking powder, baking soda and salt. In a large bowl, whisk together coconut oil and coconut sugar until well combined. Add eggs, almond milk and vanilla/almond extract and use a wooden spoon to combine. Add dry mixture to wet mixture until combined. Add 1 1/2 cups cranberries and 3/4 of the orange zest and gently stir to combine. Press batter into prepared pan. Top with crumb mixture, cranberries and orange zest. Bake for 40-45 minutes, or until toothpick inserted in the center comes out clean. Let cool completely in pan. Cut into 9 pieces and enjoy!